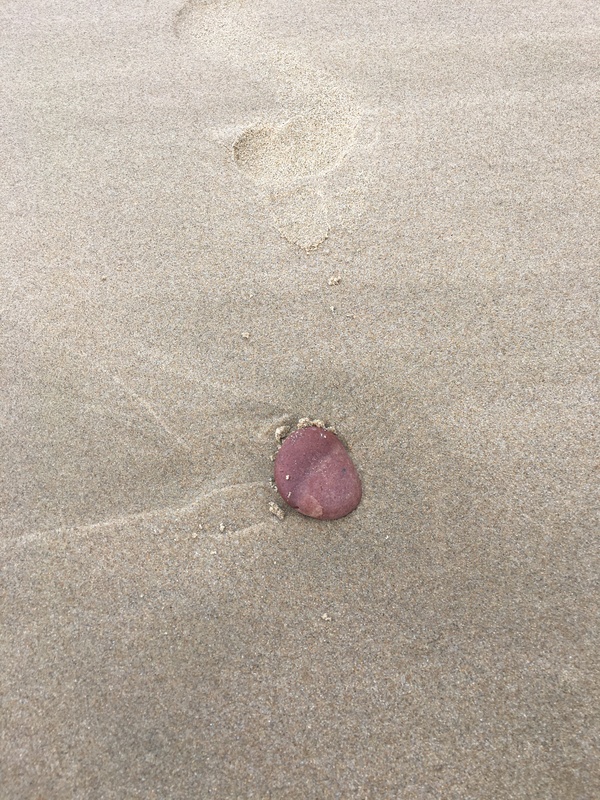 The sun was more light than warmth, the sand hard and cool, just enough for a footprint to be embedded before the sea washed it away. 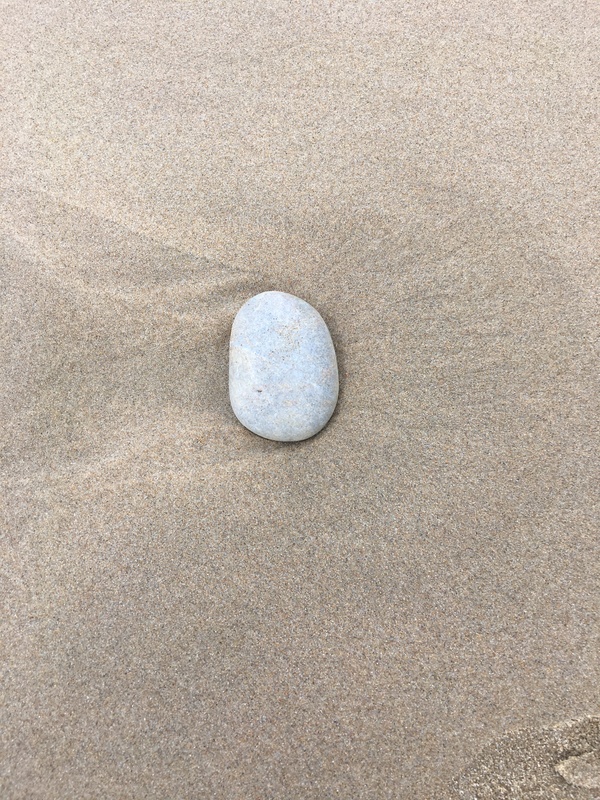 I picked up a beige pebble, rolled it over in my palm, watched a few grains of sand fall quietly. The smooth roundness remained, whole, and complete. I stood up and breathed in deeply. It was the first time I’d remembered to breathe deeply for a while. The mayhem and madness of end of a year, Christmas, New Year, and then the thoughts on the road home back to mum, seeing her now in the hospital after she’d survived a horrific attack. I wanted to give her the pebble to hold in her hand, to know that when she rolled it in her palm, she was gaining strength from the rush of the ocean, the fall of waves, her connection to the earth and of course my connection to her. 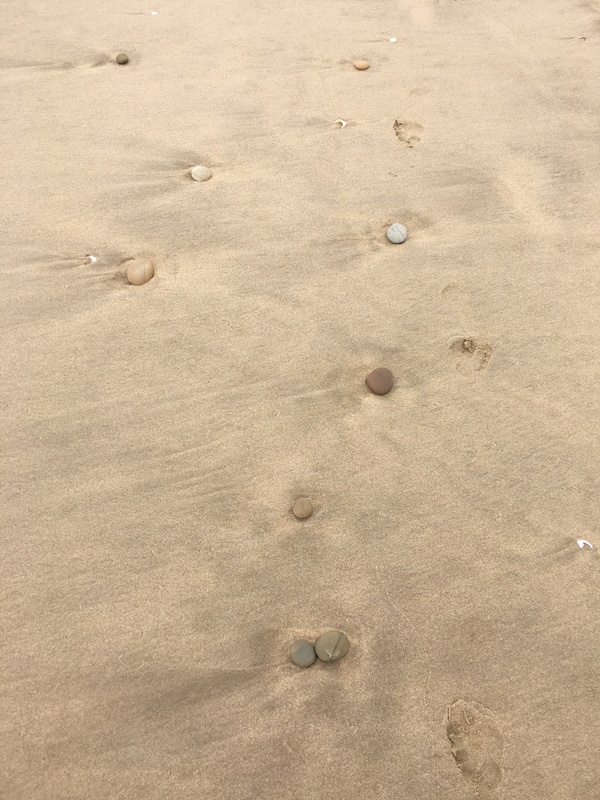 Life seems not so much a collection of years as a collection of moments scattered throughout your day, your life: like pebbles lying on the beach, bare and beautiful on the surface of the soft sand, some barely visible and lying on their side or buried just beneath the sand. 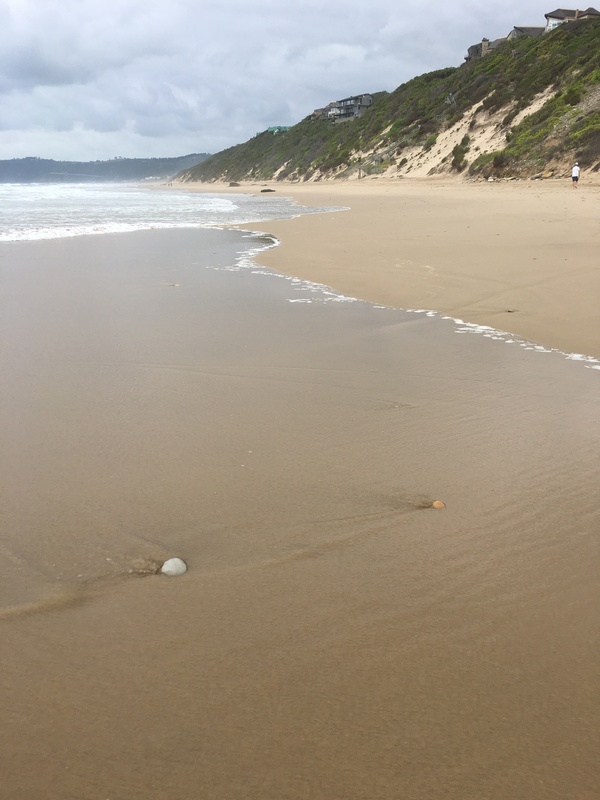 Others are newly revealed after the sea has washed over them and lie exposed on the sand, others roll down the gentle curve of the beach with the wave, back into the ocean. 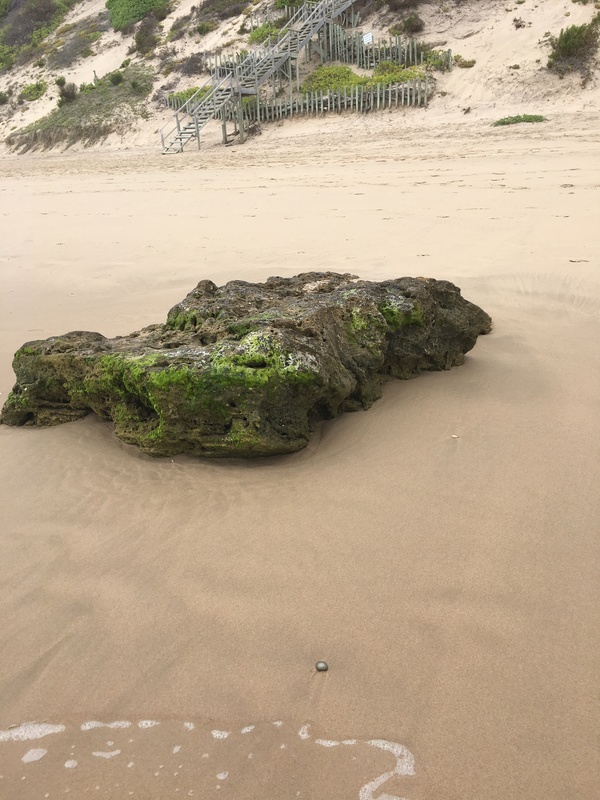 Just like these pebbles, it seemed to me, are the moments we experience in our lives: some are apparent, obvious and openly observable, others are more oblique and unrecognized until they too, roll away with the years. Much of what I’d read on the first few days of this new year had to do with resolutions: how to make them, how to keep them and why most people seldom succeeded in this. One was from a mother who resolved again, to be more patient only for her children to tell her she had named it for the year before too and in that she had failed. But she knew that, for her, this was not failure, it was a continuous step in the right direction, to practice her patience each year until she became better at it. I went back to the beach again early the next morning. The sky had clouded over and the mood was softer. It is a long stretch o f beach, mostly empty at this part, only the occasional person with a dog, or perhaps an early morning fisherman. There were my beautiful pebbles again. I can never get enough of them. Over the many years I’ve walked this beach, I’ve picked up a few and they end up scattered somewhere in my home. Every now and then I find one in the little recess of my car door. I pick it up and move it around my hand with my thumb. It connects me back to the earth. Recently I used a few to fix into the base of a cemented shower floor which needed re-doing. Here they would feel feet and warmth and be washed over with water. This time, I took pictures of them to remember what they looked like. I didn’t feel the need to collect any more, separating them from their origins. 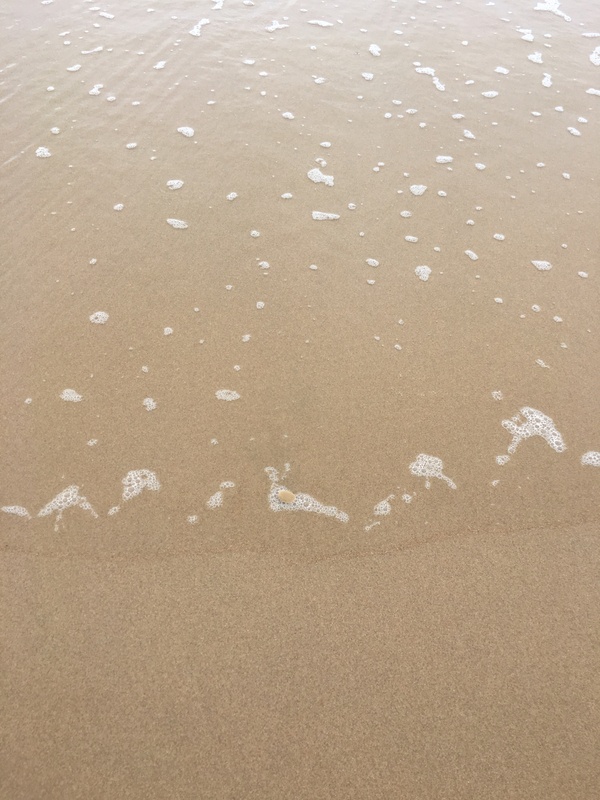 They belong perfectly right there on the beach, part of the earth to which they belong and in this way they remain connected to us too. 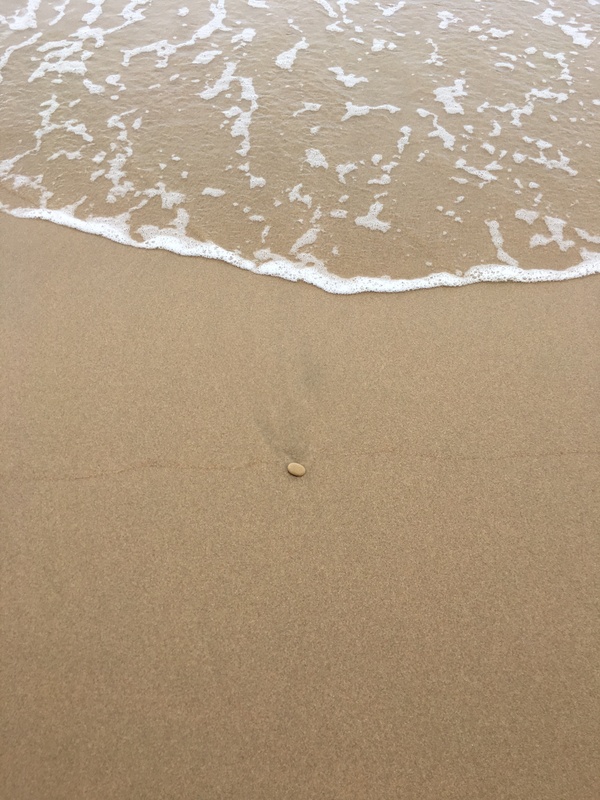 But I couldn’t help noticing how the pebbles somehow reflected the moments we live in our lives and how it was moments, rather than resolutions which we need to notice and recognize and treasure. Resolutions and goals are important to move you forward but if you miss the seemingly insignificant moments that make up most of your lives, those resolutions come to nothing. Most things only happen in a single moment or at least your experience is momentary: the first sighting of a loved one you haven’t seen in a while; the clinking of glasses around the Christmas table, the first delicious sip of champagne; the moment you see a result you’ve been waiting for- Doctor’s results, exam results, a report from a Detective on a case; the first step onto the beach, the moment the first wave washes over your feet. Of course the big ones go without saying…the moment of birth and the moment of death. But most moments are scattered in no sequence and take all colours and form. 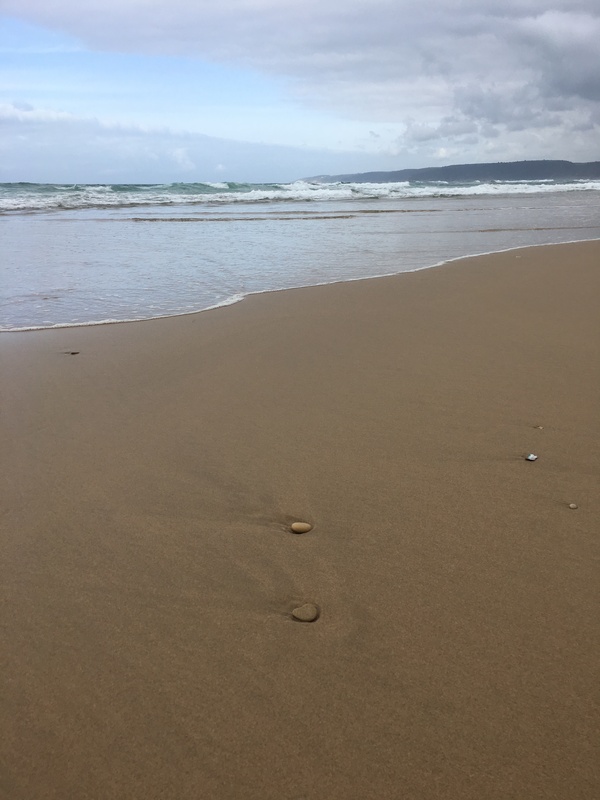 They lie quietly on your life making patterns in between the years, just like pebbles on the beach, lying quietly within the lines on the sand left by the waves of the sea. I’m going to keep reviewing my 2018 resolutions, but hope to surrender to more moments too. Here are some of the beautiful ‘pebble moments’ I saw that morning. Next postWhat do you tell your daughter to do with the power she possesses?